I write a lot about how to be better at your job, how to improve your skills and so on, and I interview a lot of experts who talk about those kinds of things. Today I want to talk about the opposite: what you should avoid doing at work. I’ve seen project managers and other colleagues crash and burn. It’s not nice to watch, and I hope it doesn’t happen to you. Here are 10 career-limiting mistakes to avoid at work. A few weeks ago I was contacted by a sales person. This happens often in my job. I told him honestly that I didn’t see any possibility of using his software at work, but that I’m revising Social Media for Project Managers for a second edition and that there would potentially be some scope in learning more about their product for that. He seemed keen and we set up a meeting. Then I heard that he was contacting my colleagues. Not just one or two but lots of them. Lots of senior managers. Telling them that he had a meeting with me and that as his software would be used by my company in the future that he should meet them to explain about it. There is a reason that project management has a code of ethics. This was embarrassing for me. I had no problem with him telling people we were meeting, which was the truth, but the “you’ll be using my application soon” part was a complete lie. And I told him so. I also cancelled our meeting. I can write my book without his case study. Career-limiting because: People find out if you lie. People find out if you exaggerate the truth. It will always bite you in the bum. So don’t do it. A good handover at the end of a piece of work is important for ongoing relationships and harmony in the office. Plus it’s good practice. Make sure that your project is handed over to the people who will be using the product long term, along with all the associated documents, lessons learned, training material and so on. Check they know how to contact you in case they need to. However, you should also make it clear that this is not your project anymore and they are responsible, otherwise they’ll lean on you for a long time. Career-limiting because: No one wants to work with the project manager who emails the operational team a closure document and is never seen again. As I talk about in my course on how to write awesome project status reports, surprises are bad. They are worse than not talking about problems but they are the inevitable consequence. If you don’t talk about problems then you risk hitting your manager with bad news. Project sponsors don’t like bad news either. Don’t run a watermelon project (that’s one that is green on the outside but red when you cut it open to examine it more closely). Talk honestly about what is going wrong. Report your project as Red or Amber when your project isn’t Green. Let people know what you are doing about it. Don’t run a watermelon project: that’s one that is green on the outside but red when you cut it open to examine it more closely. Career-limiting because: People will feel as if you don’t have a handle on what’s going on, or that you are not truthful. Or both. 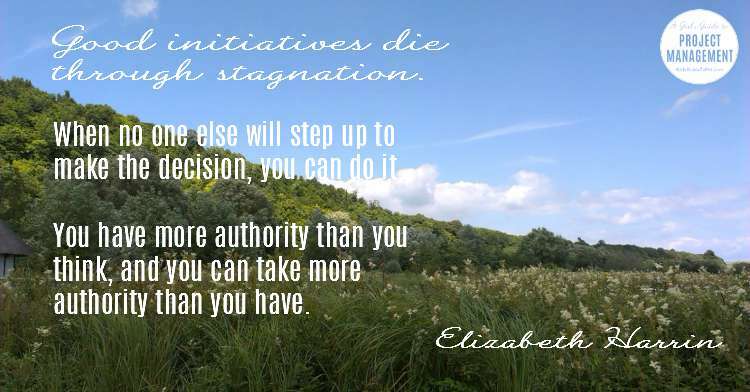 Good initiatives die through stagnation. Often we need decisions to be made and no one else will step up and do it. When no one around you will make the decision and you think it is safe to do so, make the decision yourself. Be empowered until someone tells you that you are not. You probably have more authority than you think, and you can certainly take more authority than you have. You’re managing a piece of work, so step up and do it otherwise you are not showing demonstrable leadership. You are not being accountable. The buck stops with you. End of. Career-limiting because: Managers want to work with project teams who get work done. Decisions make that happen, and show that you are acting in a leadership role. Colleagues are not an annoyance. They want a report in a different format? They want a meeting on a Friday afternoon when you’d rather be packing up to start the weekend early? It’s inconvenient, but they are your customer. Treat them accordingly. By all means negotiate the time of that meeting and try to get the best outcome for yourself as well. Career-limiting because: Other people pay your wages. Make the link. You can treat someone like a customer and still manage to say no to them from time to time. Don’t feel that you have to meet every stupid whim (project stakeholders and your colleagues are not above doing idiotic things sometimes). You’ll be faced with scope changes that they don’t want to pay for, unreasonable requests for extra work or impossibly-speedy work and more. Say no. Be polite but don’t be a doormat. Career-limiting because: You’ll be seen as a walkover and someone who is not truly in control of the work. And because if you are in a consultancy or service business and customers keep asking for work that you agree to without being paid for it, you’ll go out of business. Most post-implementation reviews end up with a list of lessons captured. Lessons captured are not the same as lessons learned. I concede that they are better than nothing. Lessons captured are better than nothing. Lessons learned are better than lessons captured. Not doing the exercise to find out what lessons the team learned when a piece of work is done means you are unable to learn from your mistakes. You will not revise and standardise your processes. You’ll never get any better at your job, and your company will never improve its organisational knowledge. Career-limiting because: You’ll never improve your performance, and you’ll never be able to demonstrate that you can improve your performance. This one isn’t your fault. Let’s say you start working on a project and then the sponsor leaves. They are not replaced. Or the project falls way down the list of priorities and although you have a sponsor named in your Project Charter they don’t actually contribute anything. However, not working with a sponsor is definitely career-limiting. Career-limiting because: You’ll have no one to champion your successes and support you. You’ll have no one who can put you forward for new opportunities based on your performance at work. What I do now as a project manager isn’t the same as what I did ten years ago. It just isn’t – my personal skills have developed as has my technical ability to do my job. Partly that’s down to the fact I’m older and have more experience, but partly it’s to do with taking an active interest in getting better. I’ve taken training courses, read books and generally looked out for my own progression. If you’re hoping to do the PMP exam then try Brain Sensei . It’s a video training course based on the concept that work is like dealing with feuding factions in ancient Japan, and very well put together. Struggling to understand Earned Value? This short online course from Andy Kaufman will help. It’s impossible not to like the training material put out by Cornelius Fichtner; I’ve listened to his online learning materials for years. The PDU Podcast is aimed at people who are collecting professional development units for their PMI credentials but it’s also full of useful material for project managers and their teams looking to keep their skills up-to-date. Get a monthly subscription here (if you don’t like it you can cancel it at any time). 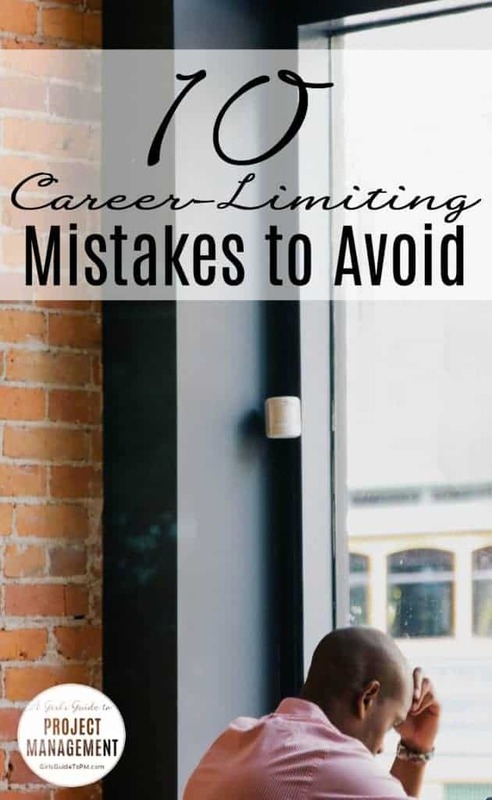 Career-limiting because: You’ll be unable to prove you are continually learning, which is often a criteria for showing your managers that you are serious about your career. You’ll limit your chances of hitting any continuous professional development requirements for your professional body. Every team has experts. They contribute to your plans. They do most of the work. As a manager, your role is to make it easy for them to do their jobs. The problems come when you used to do their job, and you still want to. Managers meddle. They override decisions made by the people actually doing the work. They make up their own estimates based on how long they think things will take. Mostly they get it wrong because life has moved on since they were in the job. They aren’t always up-to-date with the latest processes and practices. Don’t make the mistake of thinking you know better than they do. Career-limiting because: They know better than you. Honestly. Ignore them and you’ll make mistakes that could cost you the success of your project. And you know that you’re mainly judged by the success of your last project, don’t you? Bonus: Get my book, Collaboration Tools for Project Managers, to explore how to communicate faster, work virtually with people across the globe, and get better business results.